are applicable to clients of the JDK also. like to take it no further. I just about stopped reading when I hit the “structured arbitrary-length versions” feature. Let’s use another example from OSGi land… commons collections. Let’s say you needed commons collections… you were developing with version 2.1 and you decided to be smart and scope you version range this time because you thought you learned your lesson. Next what happened was that the commons collections development team released version 3.0 and declared it to be binary compatible with the 2.1 version. The potential environments your bundle can be deployed to is limited based on the scoped dependency above… even though your bundle would work fine in an environment where the commons collections 3.0 version was floating around. The ability to reuse your bundle was reduced. The crux of the problem here is that you don’t know how to scope your version ranges and in particular… versions really don’t convey anything to you as a module developer. In OSGi land, there’s a four segment version and a mantra of encoding compatibility in your version number. Each segment of the version means something. To get a good idea of how to handle versioning on a large scale, we have a fantastic set of guidelines regarding versioning bundles at Eclipse. If everyone followed the same set of versioning guidelines, you can properly setup your dependencies and as a developer, you immediately can see meaning between what you’re developing against and what you may consume in the future. 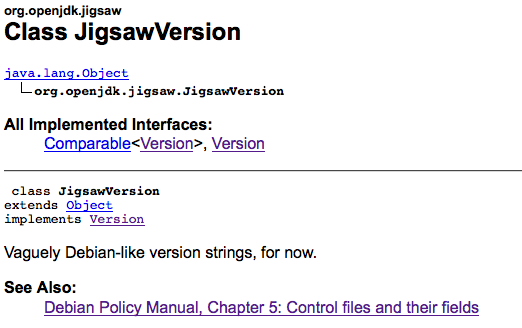 My recommendation to the Jigsaw team would be to reconsider their stance on treating module versions like nothing. I would like to see binary compatibility encoding in version numbers and given the fact that Maven is moving to the OSGi versioning scheme… Jigsaw might as well also. It would be nice in Java if we had a consistent way to talk about the versions of software we develop for people to reuse.